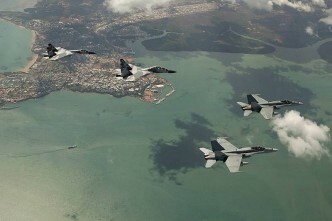 The defence budget of the Republic of Indonesia has seen a significant increase in 2012, reaching US$8 billion—an increase of 29.5% from the previous year. The funding increase is intended to meet Indonesia’s minimum essential force (MEF) requirements. One purchase will be the main battle tank (MBT) Leopard 2A6 from Germany. The final purchase of 100 units is the result of tortuous negotiations after an earlier sale of the same type of tank was rejected by the Dutch parliament, leaving the vehicles available for sale elsewhere. Indonesia is determined to boost its armour to the equivalent of the forces of Malaysia and Singapore, who acquired MBTs some years ago. But behind the purchase of Leopard tanks, there are is a crucial observation; the concept of procurement of military capability by Indonesia is not particularly well-planned. The Indonesian Ministry of Defense and the Indonesian military’s (TNI) headquarters have both expressed interest in buying the MBT, for different reasons. For TNI, it is a step up in capability, as their current armoured vehicles include only light tanks. From the government’s point of view, it’s a chance to implement a government purchase scheme which, by eliminating the role of broker, will reduce the occurrence of corrupt practices. But as the impact of financial crisis that plagued Europe took hold, Indonesia was offered an opportunity not only in the form of an offer to buy the Dutch Leopards, but also AH-64 Apache helicopters and F-16 Block 52 fighter jets (which would mean TNI would at least have weapon systems comparable to Singapore’s and Malaysia’s). But on the other hand, Indonesia’s military procurement strategies seem to be emotionally driven; Indonesia wants to be seen to be keeping up militarily with neighbouring countries. The MBT Leopard and Apaches are obviously important to boost Indonesia’s military technology, but I can’t see why they would be high priorities. Indonesia is a country with a large maritime area to police and protect. So the emphasis should be on the acquisition of maritime patrol reconnaissance aircraft, helicopter-based fleet ASW (anti-submarine warfare) and improved shipborne sensor systems for the Navy. ASW is a particular problem. Once a strong part of Indonesia’s capabilities, it was unfortunately left to degrade; for example, Wasp helicopters from Britain were grounded and not replaced. A 2005 plan to acquire over the horizon target radar for its BO-105 helicopters from PT. DI (Dirgantara Indonesia, Indonesia’s indigenous aerospace company), was canceled, leaving the Navy without adequate helicopter reconnaissance. Maritime patrol reconnaissance aircraft aren’t much better. Although Surveillance Squadron 5 Makassar operates a maritime reconnaissance version of the Boeing 737, it only has three aircraft and the technology is already obsolete. In comparison, the Malaysian Navy has long had a Navy Sea Lynx and Singapore has the Sikorsky SH-60B Seahawk. Both helicopters are equipped with torpedoes, and Singapore’s E-2C Hawkeye airborne early warning and control aircraft are able to surveil with very broad coverage. The acquisition of helicopters and reconnaissance aircraft is obviously vital for Indonesia, because they will help prevent the occurrence of territorial violations of its Exclusive Economic Zone (EEZ) and allow law enforcement to respond more quickly to incidents at sea. This means that foreign trade and Indonesian produce vital to the pursuit of economic prosperity can be secured in the waters of the archipelago. Similarly, without a clear concept of its capability development, the Indonesian government has shown hurried interest in the ‘fire sale’ Apache helicopters, and a possible follow-on buy of anti-tank missiles for the aircraft. This is not without risk. The Indonesian government should remember its previous bad experiences of the embargo of parts by the United States. While the proposed tanks and helicopters are from Dutch or German sources, the Apache is an American design, and there is always a possibility that the United States or NATO could cut off the flow of parts and weapons to Indonesia, if the Indonesian military takes action judged to be against the interests of Western countries. In some ways, it’s good strategy for Indonesia to consider defence equipment from other sources, such as India. That might require some compromises. For example, the replacement Indonesian submarines are required to match the anti-shipping missile capability of Malaysia and Singapore’s new boats, which drives up the cost and limits the possible source countries. Acquiring new submarines is important. They not only play a major role as in open war, but in times of peace submarines can carry out missions in support of broader strategic interests, such as surveillance and monitoring of the ocean. But in a limited defence budget, the ‘high-end’ capabilities might be at too high a price. Hopefully, the Leopards can be used optimally by the Indonesian military. And it never hurts to accept gifted platforms, such as C-130 Hercules from Australia and the United States, but Indonesia has to consider the cost of upgrading them. And lastly, another priority remains—the production and development of Indonesia’s domestic arms production. And that all has to fit into a budget less than a third of Australia’s. Indonesia needs to think about its priorities and plan very carefully. Haryo Adjie Nogo Seno is a defence and telecommunications journalist based in Indonesia and chief editor of Indomiliter.com, a blog on the Indonesian military capabilities.